Following our series of posts on tumour microenvironment (TME) and the role of Cox-2/PGE2 signaling, I’d like today to focus on inflammation and immunity. TME is a dynamic milieu influenced by numerous changes favoring the emergence of a tumour-promoting inflammatory environment (eg. tissue remodeling, metabolic alterations, recruitment of stromal cells (including immune cells)…). Extracellular matrix (ECM) also participate in this inflammatory environment by promoting pro-inflammatory cytokines expression (CCL2, GM-CSF). Tumour cell progression seems to be mediated by adaptative and immune cells, where differential cytokine and chemokine expression changes the balance between Th1 (anti-tumour) and Th2 (pro-tumour) phenotypes. Microbiota also influences cancer progression by regulating the inflammatory components of TME, though how this is done needs further investigation (1). Some therapeutic strategies target protumorigenic inflammatory pathways. By example, TNF together with IL-6 and CXCL12 were identified as key cytokine mediators cancer-related inflammation, having an effect on angiogenesis. (2) Studies using anti-interleukin mAbs have found therapeutic effects both in xenograft models as in clinical trials. Some other studies indicate that the use of mAbs alone may create resistance suggesting to couple IFN-b to mAb tratement. This strategy controls Ab resistance by rebridging supressed innate and adaptative immunity in TME (3). All in all, it is clear that targeting inflammatory pathways is a promising field in the fight against cancer. Which TME markers to monitor? In the immune response, there is an intrinsically high level of cross-talk between immune cells, the complexity of immune cell development, and the pleiotropic nature of cytokine signaling, which has hampered progress in understanding the mechanisms of immunosupression by which tumour cells circumvent native and adaptative immune responses. This means that looking at the “classical” immune / inflamatory markers may not be enough, but rather, biomarker profiling is needed. Also, each cancer type is different, and even among the same cancer types, immunosupression (and therefore, secreted factors) may be altered by treatment, progression, or other physiological statuses. It is therefore necessary to elucidate the specific immunosupression mechanisms for different cancer types, at different stages. We can use different technologies (e.g. secretome studies), depending on what we are looking for. And focus on biomarker profiling tools! How to find out the relevant biomarkers? A recent review describes the use of high-density, high-content antibody arrays to answer this question. In the publication, Burkholder and co-workers indicate that the use of these tools allows to discover complex mechanisms involving multiple cytokine signals from not just tumour cells, but also stromal cells and a wide spectrum of immune cell types in the TME. Cooperativity of cancer-promoting immune cells in the TME (taken from ref. 4). Several publications using antibody arrays have elucidated the role of TGF-b, Th2 cytokines (including IL-4, IL-5, IL-6, IL-10, IL-12 and IL-13), chemokines (particularly angiogenic chemokines), VEGF, inflammatory factors and GM-CSF. All these factors appear to play major roles in the immunosupression process. The role of some cell types and their contribution to cancer progression still remains to be studied. This is the case for mast cells (secreting GM-CSF and IL-4), neutrophils (N1/N2 balance), regulatory B lymphocytes, Th17 cells (secreting IL-2 and IL-15), as well as the specific role of secreted biomarkers such as IL-17 and IL-23. 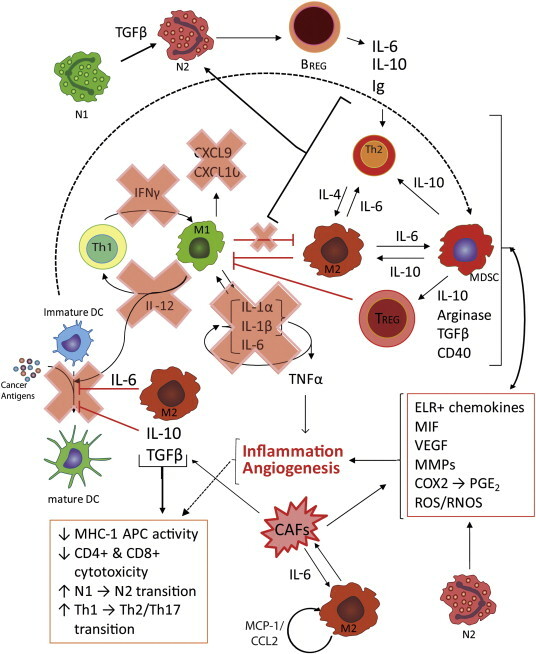 Angiogenic factors also seem to be involved in this process, meaning that tumour-induced immunosupression is tightly linked in the TME with tumour-promoting inflammation and angiogenesis at both molecular and cellular level. This suggests that combination therapies which target inflammation and angiogenesis may favorably affect the success of immunotherapies or other modalities of treament. Antibody arrays are extremely powerful tools for the identification of cancer-specific biomarkers either secreted by cells in the local TME or by the cancer cells themselves. By merely studying what is already published, we might be missing valuable information on cancer progression mechanisms that will allow to find new therapeutic targets and/or new diagnostic / prognostic markers. On your side, which TME biomarkers would you consider most important in this context? Which technology would you recommend? Leave your comments here and feel free to add your quesions or remarks about antibody arrays and inflammatory / immunity biomarkers you are monitoring in your cancer research! 1. Swartz M.A. et al. “Tumor microenvironment complexity: emerging roles in cancer therapy” (2012) Cancer Res. 15;72(10):2473-80. doi: 10.1158/0008-5472. 2. Coward J. et al. “Interleukin-6 as a therapeutic target in human ovarian cancer” (2011) Clin. Cancer Res. 17(18):6083-96. doi: 10.1158/1078-0432.CCR-11-0945. 4. Burkholder B. at al. “Tumor-induced perturbations of cytokines and immune cell networks” (2014) Biochim Biophys Acta 1845(2):182-201. doi: 10.1016/j.bbcan.2014.01.004. Epub 2014 Jan 17..